Fort Meade, Maryland, August 12, 2006 -- With all the controversy surrounding President Bush's illegal NSA (National Security Agency) wiretap surveillance program, some of the benefits and the remarkable technological successes brought into being by the admittedly unconstitutional operation can be easily overlooked. One of these unheralded achievements carries attributes that many will find surprising: namely, four legs and a tail. Meet Mother, the NSA's router-sniffing spy dog. A highly trained "Riesenschnoodle", Mother is a specially bred cross between the powerful, calm Riesenschnauzer and the intelligent, high-strung King Poodle. From his first few months of life (Mother, despite the name, is a male dog) Mother has been trained to sniff out potentially threatening telephone and email communications. Now five years old, Mother and nearly 5,000 other keen-nosed Riesenschnoodles, all named Mother, have been stationed by the NSA at major telecommunications junctions and data transmission hubs nationwide, sniffing communications to protect America. "It's an amazing program, and the Mothers are all amazing animals," said Lucky Marbles, a chief wrangler on the NSA's WOOF (Wiretaps Overseeing Our Freedom) program. "They're quiet, obedient, noble animals and all perfectly house-trained. We've had very few complaints from telephone operators about, er, accidents. Although Baltimore was blacked out for about three hours last year when one of the Mothers decided to mark his territory on a primary service transformer." According to Mr. Marbles, the NSA's WOOF program provides a "first line of defense" against potential terrorist acts planned via unencrypted telephone and email communications to and from the United States. Similar to the bomb- and drug-sniffing dogs used by intelligence and law enforcement agencies worldwide, the dogs of the NSA's WOOF program can identify potentially threatening voice and email activity using only their innate canine intelligence and an extremely sensitive nose. "We have Mothers stationed at every major telephone exchange and internet hub in America. Twenty-four hours a day, excepting for a few breaks for walks and mealtimes, these dogs sit and sniff electronic communications passing through routers and telecommunications junctions. When they detect evidence of a potential terrorist plot, they bark. That flags that sequence of communications for further investigation by the NSA." According to Mr. Marbles, the 5,000 Mothers each bark over 200 times per day on average, thereby flagging over one million individual American telephone conversations or suspect emails for further investigation. 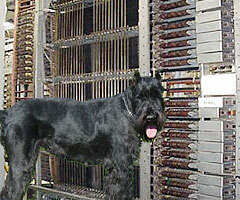 He stressed that the dogs have been trained to differentiate "as best they can" between domestic and international phone calls and email transmissions, in part by using their impressive hearing ability to detect minute differences in frequency modulation. As the WOOF program has only been operating for "less than five years", Mr. Marbles said, it is still too early to judge the overall success rate due to "limited conclusive operational intelligence." Evidence presented at the ongoing congressional hearings shows the WOOF program has in fact resulted in zero arrests and no evidence of any terrorist plots thus far. Nonetheless, he was optimistic about WOOF's potential. "Despite the unfortunate lack of evidence, I do believe that a great many lives have been saved because of what we've been able to do with this program," Mr. Marbles said. "I'm saying this program has produced intelligence for us that has been very valuable in the global war on terror -- both in terms of saving lives and breaking up plots directed at the United States. It has been a very useful source of intelligence for us, and we need to continue the program." "Admittedly, every lead the program has produced has been a dead end – just innocent Americans going about their constitutionally-protected private personal business," he said. "Sometimes dogs just bark. But you can't make dog food without grinding up a few dead animals, I always say." "I'm not particularly worried about whether what we're doing is legal or not," Mr. Marbles continued, "even though it obviously violates the Foreign Intelligence Surveillance Act (FISA), the law created to prevent people like Nixon and J. Edgar Hoover from doing exactly the same thing. But President Bush ordered it, and it's my job to do what the president tells me to do. It's up to him and his Attorney General, I guess, to decide when laws and the Constitution don't apply."